L 10 1/2″(27 cm) W 23″(58 cm). Rufous crown, back, and tail. Slate blue wings. 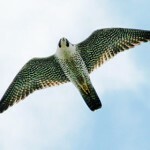 Buff-colored breast. Black spotting on belly. Double black stripes on a white face. 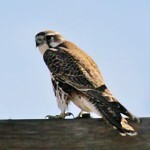 Female has similar head pattern, but back and wings are brown. Female has heavier streaking. Behavior: Nests in old woodpecker holes or nest boxes near grasslands or croplands. 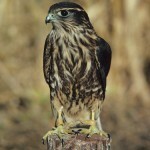 Habitat: Often perches on elevated sites such as telephone poles and trees in open country. Where in Nebraska: Common statewide permanent resident. 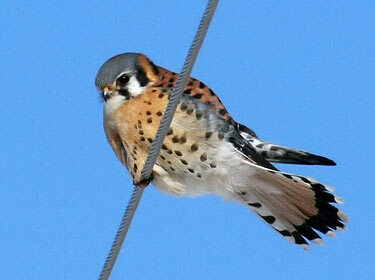 Some individuals migrate, as kestrels are less common in winter than in spring or fall. Regular breeder. Fun Facts: Nestling Kestrels back up, raise their tails and squirt feces onto the wall fo the nest cavity!